Festival Pass includes entrance to VIP closing ceremony/party with festival performers. THE AUDIENCE TOO is encouraged to come be a part of the performance! Wear your most expressive/outrageous costume/look, and help celebrate the festival's theme of TRANSFORMATION. An on-site makeover room will stand ready to accessorize willing participants, and photographer Kristopher Johnson will have a photo booth set-up during part of the festival. Expect a pageant & prizes! 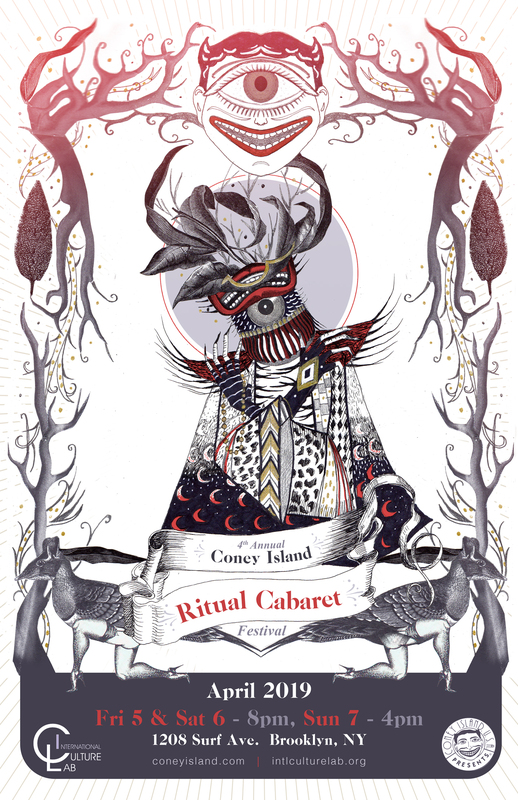 The Coney Island Ritual Cabaret Festival marks International Culture Lab's (ICL) 4th consecutive year probing the fantastical partnership of ritual and entertainment on Coney Island USA's (CIUSA) Sideshows by the Seashore stage. This year again ICL has assembled an array of performance artists, musicians, magicians, puppeteers, sideshow performers and dancers, all of whom have been tasked with presenting original works that define "ritual cabaret" through the lens of their own particular aesthetic, discipline and lineage. The history of the Coney Island Ritual Cabaret Festival is informed by dancer/choreographer Tatsumi Hijikata who in the 1950's originated butoh with his ensemble of burlesque dancers in an effort to defy and subvert authority, including conventional notions of dance, thereby seeking transformation -- on the personal, societal and political level. Inspired by this historical reference, in its call for proposals, ICL challenged artists to deconstruct and reinvent their particular art form, whatever it might be. We asked: If the goal is TRANSFORMATION -- of the self, of society, of politics -- what will it take to bring this about? Is it possible to invent a new genre? What is Ritual Cabaret to you? Cabaret, burlesque, vaudeville, and circus sideshow have a long & storied history in Coney Island, and Coney's rich legacy of amusement, community, and innovation make CIUSA the perfect venue to explore the boundaries of ritual & entertainment. With Ritual Cabaret, ICL and CIUSA have undertaken to merge their respective focal points in a powerful new way. Sunset opening ceremony on the beach -- 7:15pm, Boardwalk & W. 12th St.